On this three week grand tour of Iran we are welcomed by friendly Iranians as we discover ancient assassin's castles, Zoroastrian fire temples, troglodyte villages, fine Islamic architecture and a rock hewn necropolis. We explore north-west Iran, a rural mountainous paradise rarely visited by tourists where we eat dinner by the Caspian Sea, wander through colourful bazaars and stay with locals. We uncover Persian history at Persepolis, watch a local wrestling show in Yazd and see incredible mosaic art in Isfahan. This in-depth trip of Iran will start in the country's capital, Tehran. Many flights arrive into Tehran in the early hours of this morning. For those arriving on one of these flights there will be time to freshen up and possibly a short sleep before we begin our exploration of the city. This afternoon we will visit the National Museum, a great introduction to Iran as the museum has relics from 4000BC right up to the modern day; with a specific focus on the Persian Empire. This sets the scene for everything we will see over the next three weeks and really whets the appetite for the wonders of Iran. We move on to the Golestan Palace, a complex of 17 royal structures spread throughout the site - though don't worry, we won't visit all 17! We will see the gaudy mirrored ceilings, quite spectacular marble throne terrace and the impressive stained glass windows as we are guided through the complex. This evening is free to visit one of the many excellent local restaurants to enjoy some local specialities like Dizi, a beef, lime and chickpea broth. We have a full day to explore Tehran today and our first stop is the fascinating Reza Abbasi Museum, home to a large and unique collection of Persian art, some of which dates back to 2000BC. The museum also contains some mesmerising maps about the spread of Islam and the history of Persia. Our next stop is the Jewellery Museum, which is where the Iranian crown jewels are contained, though the highlight of the visit has to be the outrageous Globe of Jewels, which is covered with over 51 thousand gemstones. We will have lunch in a local restaurant in the north of Tehran and then visit the Tajrish Bazaar, a colourful and bustling market to experience the warmth of the Iranian people as they welcome us to their country. A quick walk will take us to Imamzadeh Saleh Shrine, a popular pilgrimage site for locals before our boarding our bus and heading back to the hotel for the night. This morning we leave Tehran early and make our way north-west towards the Valley of Assassins. This fertile mountainous area has been famous for over a thousand years for the Ismaili community that once dominated the land; and though many of the castles are not in the best state of repair, it is their setting that is most striking. We will travel to Gazur Khan village where we make our ascent up to Alamut Castle and spend an hour at the site, which has impressive views out over the valley. From here our journey continues to Qazvin, our base for the night. Today we drive through mountainous forest to the Ismaili fort of Qaleh Rudkhan, an impressive castle which still has 65 intact towers and some 1500 metres of outer wall that was first built 1800 years ago. We continue our drive to Fuman, a small town which is known for selling warm biscuits containing walnut paste known local as kaluche. After we have stocked up on biscuits we head to Masouleh, a scenic hill village where we will stay in a traditional local house. Depending on our arrival time, there may be a chance to explore the village and walk up to the hill on the other side of town for picturesque views of Masouleh. Though the driving distances are short in the Valley of Assassins, the winding roads ensures our journeys are long and the pace unhurried; but this just means we have more time to immerse ourselves in this beautiful region. This morning there is some more time to wander the streets of Masouleh before we leave the mountains behind and drive back to Fuman. Here we will visit the Guilan Rural Heritage Musuem, a unique site which is dedicated to preserving and promoting the customs and culture of the Guilan region of Iran. The museum is located in a huge forest park and covers an area of 45 hectares, that's the size of 45 rugby pitches, all for a museum! There are over 80 structures in this area which are all dedicated to different aspects of traditional rural life, such as a blacksmith, rice barn, charcoal making furnace and an old rustic mosque. 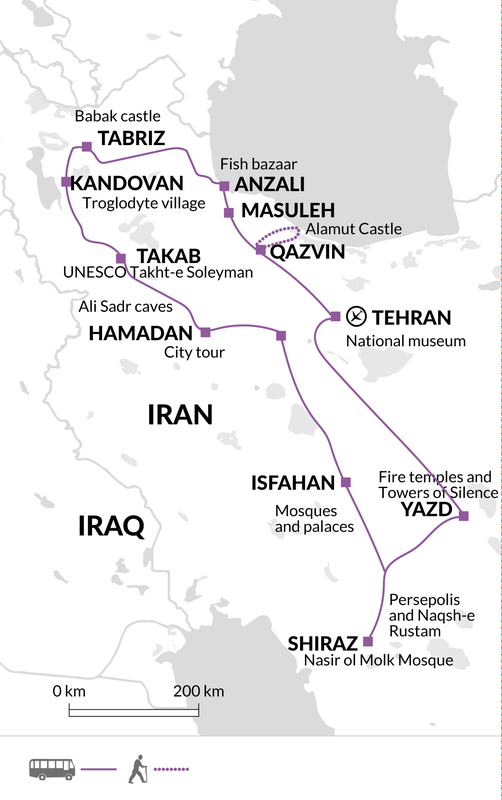 We will spend a couple of hours wandering around the site before driving to Bandar-e Anzali, on the Caspian sea. This evening we will have dinner in a local restaurant. This morning we will visit the fish bazaar of Bandar-e Anzali before heading into the area known as Eastern Azerbaijan - though we are staying in Iran for the duration of this trip. Our destination today is the city of Tabriz, but as we cut inland from the Caspian Sea we will stop at the UNESCO World Heritage Site of Sheikh Safi's Mausoleum in Ardabil. The shrine is popular for its large blue tiled domes of the mausoleum, which are reached by walking through seven rooms that represent the seven stages of Sufi mysticism. We continue on to Tabriz, our home for the next two nights; we aim to arrive late afternoon and there should be some free time to explore our surroundings this evening. Today we will explore Babak Castle, a Sassanid fort named after Babak the warlord. The walk can be quite arduous and the round trip is expected to take around five hours, this includes at least an hour to get up to the castle at the top of a hill. Though a tiring walk, the views from the top of the surroundings mountains, forest and jagged cliffs are simply breath-taking. We will return to Tabriz after we have descended. For those that don't fancy the climb can stay in Tabriz and visit the Saint Mary church, Tomb of Poetries, Mashrooteh House and the Shahriar museum. This morning we have a city tour of Tabriz, starting with the UNESCO listed Bazaar, one of the oldest in the Middle East and thought to be the largest covered bazaar in the world. The roof of the Bazaar has beautiful arched brickwork and we can expect to chat with the Bazaaris as we buy tea from the many tea shops dotted throughout the complex. We will visit the 19th century citadel and then onto the Blue Mosque, known for its blue and turquoise tiling which has been attracting visitors for 600 years. Leaving Tabriz behind, our next destination is the troglodyte village of Kandovan. The homes in this hill village were carved out of the lava flow from the now dormant Mount Sahand, the residents claim that their cave homes are over 700 years old. We will spend the afternoon exploring the village and tonight we will stay at a luxurious cave hotel built into the rock. We are introduced to Zoroastrianism today as we visit the ancient site of Takht-e Soleyman. Predating Christianity by many centuries, the Zoroastrians were possibly the first to believe in an omnipotent God. Surrounded by mountains, the site is impressively located around a large volcanic lake and features the remains of a citadel which housed one of the most important Zoroastrian 'Great Fires'. We will spend a couple of hours in this beautiful location and then drive to Takeb, our night stop this evening. Ali Sadr is the largest water cave in the world and consists of deep lakes, huge chambers and is thought to be eleven kilometres long. We will discover the network of tunnels by a small pedal powered boat - pedalled by our guide, as we are given a guided tour of this subterranean wonderland. Driving south through green agricultural land we arrive at Hamadan, a historically important town due to its strategic location on the road between Iran and Iraq. After checking into our hotel we will visit the tomb of Avicenna, a 10th century Islamic scientist, there is an interesting museum on the site as well as great views over the towering Mount Alvand. Our tour also includes a visit to the Alavian Mausoleum and the Lion of Hamadan, a statue whose nose is rubbed by local ladies looking for luck in love! Leaving Hamadan we spend the morning driving to Isfahan, without doubt the most beautiful city in Iran, quite possibly the Middle East; filled with colourful mosques and peaceful squares centred around fountains. Today's journey will take the majority of the day but along the way we will take breaks to get lunch and to stretch our legs. There are scenic views, including snow-capped mountains, to enjoy on the route. This evening upon arrival in Isfahan there is time to walk along the river to Sio Se Pol Bridge, which is lit up at night and is a favoured place for young Iranians to meet and catch up. Undoubtedly a highlight of any trip to Iran, Isfahan is full to the brim with beautiful architecture, squares, parks and bazaars. We will first head to Imam square, one of the largest city squares in the world that is surrounded by lavishly decorated mosques and dotted with fountains; it is also a popular place for local residents for picnics and socialising. We will spend most of the day in and around the square and our first stop is the Ali Qapu Palace which has a balcony overlooking the square. We then cross the square and enter Sheikh Lotfollah Mosque, known as the Ladies mosque; it has an ornately painted domed ceiling and an elaborately decorated entrance. From here we will visit the Shah's mosque, regarded as a masterpiece of Persian architecture and along with the square, is classified as UNESCO World Heritage site. Today we will continue to discover the sights of Isfahan as we visit the Chehel Sotun Palace, containing a huge number of paintings and frescos depicting famous scenes of Persian history. Chehel Sotun means forty columns, which represents the twenty columns which support the pavilion and are reflected in the lake that leads up to the palace, which make it appear to have forty. We move on to the Jameh Mosque of Isfahan, while not as visually stunning as the mosques in Imam square, the Jameh Mosque has been in the city since the 8th century so has many different styles of architecture and decoration. It is one of the oldest standing mosques in Iran and has seen many fires, wars and rulers, so there is lots of interesting stories to learn whilst exploring. The mosque is also at one end of the extensive bazaar complex, which snakes for four kilometres all the way back to Imam square, there will now be free time to wander through the bazaar and do some shopping. We have a full day's drive south to the city of Shiraz. Depending on timing, we will aim to stop at a converted caravanserai for our lunch stop. The caravanserai were originally created for travellers in the desert to have a safe place to eat and drink; many of them still have the same purpose now, ours will just be a bit more modern! If we do not make the Caravanserai we will have lunch in a local restaurant. For today's drive, it is recommended to stock up on Iranian snacks such as pistachios, dates and other dried fruits as they are great for sharing amongst the group and keeping everyone occupied. This morning we leave the hotel early to drive to the rock hewn royal tombs of Naqsh-e-Rustam where Darius I and his successors are buried. We spend time exploring the site, before continuing on to Persepolis. Situated in high steppe-land, the legendary capital of Darius the Great was founded in 512 BC. There was no more impressive construction in the ancient world, except perhaps Karnak in Egypt. Darius built the terrace, the Apadana (great audience hall), the Tachana (palace), the monumental staircases and his son, Xerxes, added the harem and the Hall of 100 Columns. Though a shadow of its former self, the soaring pillars, terraces and bas reliefs of Persepolis are sure to impress. The remainder of the day is left free for you to explore Shiraz, and try some of the local delicacies including the shirazi salad, a spicy and healthy accompaniment made of tomatoes, onions and peppers. Today we enjoy spending time exploring some of Shiraz's many treasures. First we will visit the Narenjestan Gardens home to the Narenjestan-e Ghavam pavillion. From here we take a short walk to the Nasir-al-Molk Mosque, a highlight of the trip. The mosque has stained glass windows which, in the morning illuminate the room with a kaleidoscope of colours and just sitting in the corner in this ambient atmosphere has got to be good for the soul. We will also visit the serene courtyard and mosque of Shah-e-Cheragh Shrine, a popular site with local tourists and citizens of Shiraz. The rest of the day is free to explore Shiraz. There are plenty of sites to discover, you may choose to visit Saadi's Tomb or the historic Eram Gardens. Shiraz is known as the friendliest city in Iran, which in a country full of smiling happy people is some accolade! Iranians love to find out where you are from and ensure that you are enjoying their hospitality, so walking around Shiraz is a real pleasure with lots of fun conversations and interactions. Leaving Shiraz behind us, we head north -east on our way to Yazd, stopping at the ruins of Pasargadae, where Cyrus the Great built his capital. Although quickly superseded by Persepolis, Pasargadae has enchanted travellers through the ages - including Alexander the Great. It is a full day's drive today, but we will stop at a local restaurant for lunch and a Yakhchal (ice house), a domed structure with a large subterranean area used to store ice in the middle of the desert. Tonight there is the option to experience zurkhaneh, a traditional strength and wrestling event. Though visitors are allowed to enter for a fee, this is a part of Iranian culture where locals work out and wrestle whilst a leader bangs the drums, sings and reads poetry. This morning we visit the Towers of Silence, built on a hilltop outside the town, these traditional Zoroastrian burial grounds are where bodies were quickly returned to nature by being devoured by vultures. Continuing our exploration of the Zoroastrian culture, we visit the Ateshkade or 'Zoroastrian Fire Temple'. In the temple we see a flame that has burnt continually for more than 1500 years. The afternoon we will explore the famed old city. Described by many as a living museum, the clay-brick houses and ancient Islamic buildings, seemingly woven together in a maze of narrow alleys, are best discovered wandering on foot. We have a long day of driving back to Tehran today, with a stop at a local restaurant or caravanserai for lunch and will have some to explore the majestic Jameh mosque of Na'in. As we approach Tehran we will visit the Mausoleum of Ruhollah Khomeini, architect of the Islamic Revolution of Iran. This evening we will have our final dinner in Tehran, to have a chance to reflect on the adventures we have had and say our goodbyes. Our trip finishes after breakfast in Tehran. Much of Iran is arid desert and mountain. The harsh climate has great extremes of heat and cold between summer and winter. Average annual rainfall is below 25cm and usually confined to winter and spring. Summer (Apr- Oct) is very hot, whilst winter temperatures can reach -4. Spring and autumn are best. Iran is a traditional Islamic country and a strict dress code is enforced throughout the tour. Head - A headscarf must be worn by women at all times, preferably tied under the chin. Some hair can be shown (remember to pack a headscarf in your hand luggage for arrival). The Manteau should hide the shape of the body and must be mid-thigh to knee length. It is best to purchase a manteau or similar such as a 3/4 length cotton coat that hides your shape and covers your arms prior to your arrival in Iran. A long baggy men's shirt or loose dress can be used instead of an overcoat, but the above principles must apply. We recommend one cotton or linen length manteau for the south and a warmer one for the north. However, if it is not possible to purchase, long shirts or coat will suffice. Underneath the 'manteau' anything can be worn! April to September can be hot (approx. 30 degrees plus) - A bra and light cotton trouserskirt is sufficient. Pack for hot conditions during this period of the year. March, October, November can be cold (approx. 12 degrees) - warmer clothing is needed under the manteau and you will need a warm fleece or jacket for cold nights. Bring waterproofs between Oct-Apr. The 'chador' - 'coverall' - is only worn at holy shrines and can be borrowed locally. Dress code is more relaxed in some towns and brighter garments are being worn by young locals. Men must wear long trousers. Short sleeved shirts are acceptable but most Iranian men wear full length sleeves. April to September can be hot (approx. 30 degrees plus) - Pack for hot conditions during this period of the year. March, October, November can be cold (approx. 12 degrees) - warmer clothing is needed, you will need a warm fleece or jacket for cold nights. Bring waterproofs between Oct-Apr. You may find when you arrive in Iran that some local Iranians do not dress as traditionally or strictly as we have suggested above. Explore feels that it is socially correct for our travellers to be responsible in the way they travel and respect all country traditions so we would advise that you try to stick to our advice as closely as possible and then once in Iran you can make your own decisions as to how much is appropriate to cover. Your tour leader can also advise you on this in each location. Comfortable shoes/trainers for the city tours and traveling in. Walking trainers/boots are recommended for exploring the castles in the north-west of Iran. One main piece of baggage, an overnight bag for local homestay and a daypack. Bring a sun hat, waterbottle, torch and a universal plug for hotel basins. A small foldable shoulder bagatchel for museums, as most do not permit backpacks only handbags and bags of a similar size. As there are no recycling facilities for plastics in this area, to cut down on waste plastic resulting from buying bottled water (tap water is ok to drink in Iran). Tipping isn't compulsory, and we work hard to ensure that our leaders all receive a fair wage. However, you might want to recognise a leader that's done a great job or really added to your trip by giving them a tip. We're often asked about the recommended amount. It's a tricky one, and down to personal preference, but we'd recommend between £15 to £20 per person per week as a guideline. £0.90 Please note that alcohol is not available within the country of Iran. Major hard currencies are accepted in the main cities but we advise taking all of your spending money in Euros or US$ cash (Travellers Cheques can be hard to change). Once you arrive in Iran there will be no way for you to get any extra money so please make sure you bring plenty with you so that you do not run out. On this trip we are mainly staying in 3 star hotels in central locations of Iranian towns and cities, the exceptions are in the first part of the trip when we are in the Valley of Assassins. We will stay at a local house in Masouleh, where we will see a traditional Iranian house. The local house has shared facilities and we will be spending the night on a sleeping mat on the floor. Our premium cave hotel in Kandovan is reputed to be one of the best hotels in Iran the definitely the first 'boutique' hotel in the country. Due to the high numbers of visitors to Iran and the limited tourism infrastructure we are finding that on occasion hotels may cancel our reservations at short notice. While we do all possible to avoid this, there is a chance you will be subject to some accommodation changes during your trip. Any changes made will be to an accommodation of equal or a higher standard. Due to the high numbers of visitors to Iran and the limited tourism infrastructure we are finding that on occasion hotels may cancel our reservations at short notice. While we do all possible to avoid this, there is a chance you will be subject to some accommodation changes during your trip. Any changes made will be to an accommodation of equal or a higher standard. We are confident that any changes to your accommodation will not detract from your enjoyment of this incredible country. As of 19 Sept 2018 - FCO advises British-Iranian dual nationals against all but essential travel to Iran. Due to this we are now unable to accept bookings from clients who meet this criterion. An Iran visa is required by all nationalities, and must be arranged prior to travel. Please consult with your nearest Iran Consulate for further, up to date information regarding the visa process, costs and any relevant supporting documentation that you will need to supply. Please note - All visa authorisation code/invitational letters arranged by Explore are on a group visa basis which does not permit any independent travel within the country and requires for all traveller to be on an arranged tour with a tour leader at all times. In order for Explore to obtain the necessary authorisation code/invitation letter on your behalf, we will require a clear colour copy of your passport photo page and all pages with visas and/or country stamps to reach us 12 weeks before you travel. In addition to the colour copy of your passport pages, you'll also need to supply us with further personal information including a head and shoulders digital photograph of the applicant in front of a white area, a C.V./resume (max. 2 pages), username information for all social media websites you are a member of, and email and telephone contact details (please provide the same information you will provide on your visa application form). Explore will be in contact with you regarding this information no later than 12 weeks before you travel. If you have made your booking between 10-12 weeks before you travel we require your personal details immediately. You can submit your application for your visa, once Explore has obtained your authorisation code/invitational letter and sent it through to you. Please note, if you intend using the London or Dublin Consulate, then we strongly recommend to contact them first to confirm that they have your authorisation code/invitational letter or alternatively to wait a minimum of 3 working days after you have received your authorisation code before attending the Consulate. Please do this before you attend the consulate, as they will not accept your application if they have not received your authorisation code/invitation letter from the local Iranian authorities. For non-UK residents, please contact your nearest consulate for the most up to date information on visa costs and required documentation as this can vary depending on your nationality and country of residence. Most Consulates provide a 5-7 working day visa processing service. Please note the authorisation code is only valid for 30 days from issuance. For UK residents, applications are only accepted in person at the London or Dublin Consulate. Please note that you'll need to submit 2 passport photos (women need to wear a head scarf for these photos), along with your passport and visa application form to The Iranian Consulate in London or Dublin. Currently the London Consulate is charging approximately £170.00 per person for the visa. Please note, any women attending the London or Dublin Consulate in person will need to wear a head scarf. Please ensure that your passport has a minimum of 6 months validity from the date of return to your home country. Please note that any passport that contains an endorsement or a visa for Israel or stamps from other countries' border crossing points with Israel, regardless of whether it has expired, will not be accepted. Iran has a strict visa process with some extensive background checks on all applicants, and may reject an application for numerous reasons including but not limited to sensitive occupations linked to politics; the media; military. If your visa request is rejected by the Ministry of Foreign Affairs in Iran then Explore will provide a voucher for all recoverable costs. Please be aware that entry may also be refused to some countries if your passport bears stamps or visas (valid or expired) from certain countries. Please bear this in mind when booking/traveling to certain destinations as it can negatively affect your future travel plans. All visa information is subject to regular change, so please check with your local consulate for the most up to date advice for the countries you intend to visit. Nothing compulsory, we recommend protection against malaria, typhoid, tetanus, diphtheria, polio and hepatitis A. Consult your travel clinic for latest advice on different prophylaxis available against malaria. Please check the latest requirements with your travel clinic or doctor prior to departure. The above is not an exhaustive list. Further information regarding vaccinations and travel health advice can be found by following the NHS and NaTHNaC links at Explore Travel Health and from your local healthcare provider. Visa and vaccination requirements are subject to change and should be confirmed by you before travelling. This three week adventure is perfect for travellers with more time to spare and who want to really get under the skin of Iran. It is the most explorative trip of Iran in the market, whilst still seeing all the historical highlights in this beautiful and tranquil country.